In December, board members, physicians, Mother & Baby Committee members and CHRISTUS Spohn Associates, along with friends of our healing ministry, came together to take part in a ceremonial demolition at CHRISTUS Spohn Hospital Corpus Christi – South for the Demo Day Celebration of the Mother and Baby Floor Renovations. Everyone grabbed their safety gear and sledgehammers to help knock down part of the wall of NICU I. 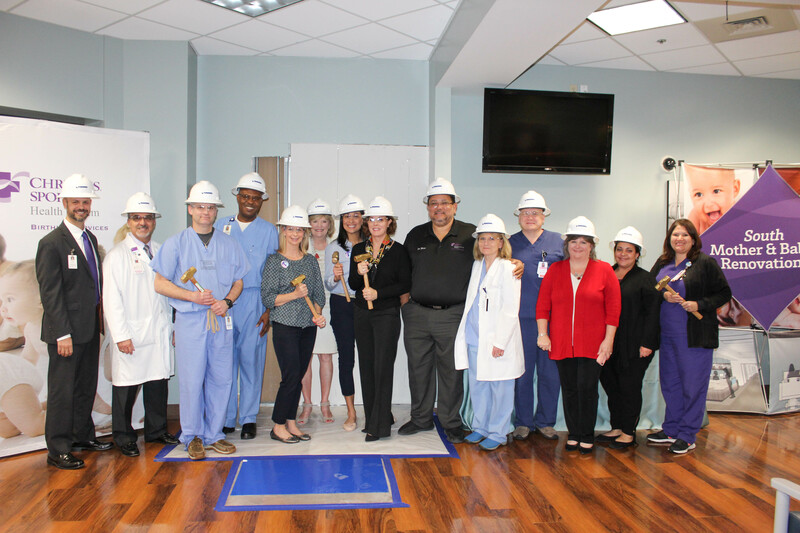 Generous donations given by Foundations, individuals, and companies, are enabling CHRISTUS Spohn – South to transform its Mother and Baby patient floor into an ultra-modern environment. The new renovations will offer families exceptional facilities that support the overall birth experience as well as the health of both mom and baby. “Moms can feel very confident that CHRISTUS Spohn – South is prepared to welcome our littlest patients on their biggest day,” said Mark Casanova, President of CHRISTUS Spohn Hospital Corpus Christi – South. Renovations will include a new Home-Away-From-Home Room, expanded and updated nurses’ station, updated family waiting room, 24-bed Level III NICU Units, lactation room, remodeled post-partum patient rooms, physician on-call room, and state-of-the-art- security system. We look forward to the completion of the project and are thankful for these exciting renovations for future newborns and their families.